Sunday, September 2, 2018 at 6:30 p.m. 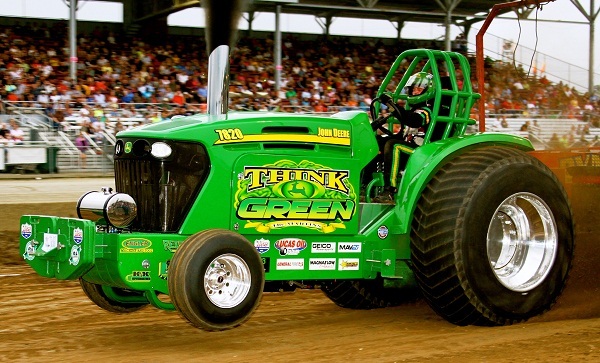 The Full Pull "Smoker Series" is made up of two divisions of the strongest running tractors in the eastern United States and the mid-western United States. The Pro Stock Tractors run at 10,000 pounds and must adhere to the same rules as the Pro Stocks running on the national circuit. The best modified Big Rigs trucks in America are expected to participate in the Big Rigs Pulling Series in 2012. The name and title 'Big Rigs Pulling Series' is a certified trademark associated with modified semi truck pulling in the United States and can only be used at those pulling events that are specifically sanctioned by Full Pull Productions, Inc. The LICENSED 2.6 DIESEL 4x4 division is one of the fastest growing classes in pulling across the United States. There are more trucks competing in 2.6 DIESEL than in any other class of competition. This class is open to all street licensed and street driven diesel trucks with a turbo-charger inlet of 2.6 inches in diameter or less. One of the most popular tractor classes in the eastern United States is the combined division for Limited Pro Stock and Super Farm Tractors. The Super Farm Tractors may run up to 640 cubic inches but that class is limited to a much smaller turbo-charger. A great variety of manufacturers and thus a great diversity of ‘color' in the class. Ford, New Holland, International, Case, John Deere, Oliver and Duetz are all seen in this class. The division is sanctioned through USA-EAST Sled Pulling, Inc.